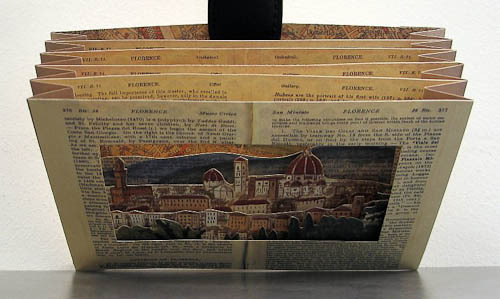 The Smithsonian American Art Museum/National Portrait Gallery (AAPG) Library is pleased to acknowledge the donation of the artist book Florence by Laura Davidson. The book was donated by a library staff member and can be found in the online catalog. The AAPG Library has a collection of artist books (a book or book-like object that is intended as a work of art by its creator) and currently has a display of examples in the reading room. An interview with the book artist Laura Davidson has been featured previously on this blog. The AAPG previously had 5 books by this artist in its collection, but not any of her tunnel books. A tunnel books consist of a set of pages bound with two folded accordion strips and viewed through a central hole in the cover. The pages consist of a series of illustrations cut in different shapes and placed one behind the other. Openings in each of the pages page permit the viewer to see through the entire book to the back, and images on each page work together to create a sense of depth. What results is a dimensional scene like looking into a tunnel. Florence is the first in a series that show the artist’s favorite views. This book shows a panorama of the city of Florence from the steps of the church of San Miniato al Monte. 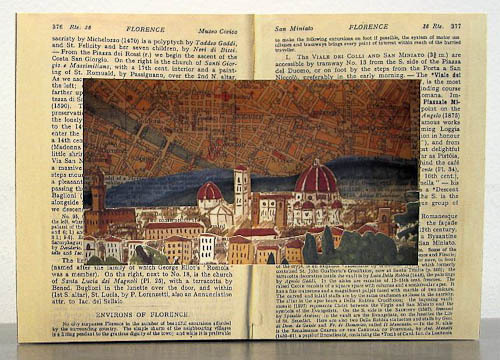 The artist has painted on Muirhead guides and Baedeker travel guides. The book is printed on #65 Mohawk superfine Warm White and the pages are laser cut and assembled by hand. The AAPG library is delighted to add this book to its artist book collection and is grateful for the generosity of the donor. The book will now be available to users for display and study for generations to come. Next Post Welcome Dave Opkins!